Demonstrations were expected across Morocco on Sunday called by the country’s youth-based February 20 Movement that has rejected constitutional reforms proposed by King Mohammed VI. “We are coming out on Sunday because we love this country and because our demands have not been met,” the movement announced in a video on its Facebook page. “Because justice will not be independent and inequalities will not disappear, we are coming out today,” said the video, which showed a group of young people announcing their intention to demonstrate. The February 20 Movement says the reforms announced by the king in a nationwide address on Friday do not go far enough. “The decision to keep up the pressure was taken before the royal speech because the indications beforehand did not give much hopes of anything positive,” economist Fouad Abdelmoumni, who described himself as a “sympathiser” with the movement, told AFP on Sunday. “The king continues to hold exorbitant powers and in any event, political reform is a long and perilous process,” he added. 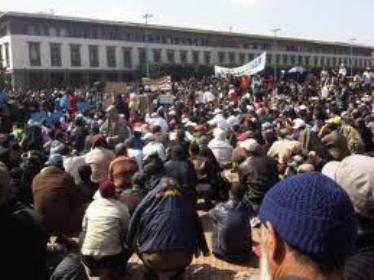 Apart from the capital Rabat, peaceful protests were planned in several other cities including Tangiers in the north, Marrakesh in the south and central Fes, members of the movement said. The 47-year-old monarch, who took over the Arab world’s longest-serving dynasty in 1999, currently holds virtually all power in the Muslim north African country, and he is also its top religious authority as the Commander of the Faithful. The prime minister, now to be called the “president of the government,” will have the power to dissolve parliament, hitherto the monarch’s prerogative. Mohammed VI also pledged an independent judiciary. Most political parties reacted favourably to the proposed reforms, which would boost the powers of the prime minister while preserving the king’s pivotal political and religious role.